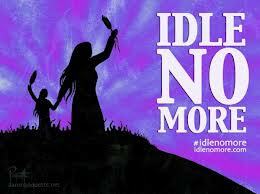 Idle No More has gone viral. This is the window of opportunity for the government to show leadership. How? In every major city in the world you will find restless youth, or chronically unemployed young adults, all from age 19 to up to their 40’s. The business news is bad from the mainstream media. Everyone knows someone who is proficient in conspiracy theories. They are always referring to the coming economic crash to a reptilian run society. In every college, or university, graduates are fleeing their countries, escaping virtual debtors’ prison in their home country. This could be the United States, Canada, the UK, or the EU. This problem is everywhere. In the 1990’s, to teach ESL abroad one needed a university degree with a bachelor of education. Not any more. All one needs now is to have a mother tongue that is English with an ESL (English as a Second Language) certificate. My argument is very simple. Tell Aboriginal youth to stay in school, graduate from high school, get an ESL certificate. Then send them to China, or India, or Thailand, or even the Middle East. In such an experience, these disenfranchised young people will get a sense of responsibility, find their freedom, and see the world. They then can come back to their reserves and motivate other Aboriginal youth to do the same. Maybe they will not see suicide, or addiction, as an option. Maybe they would want to become a teacher, doctor, a lawyer, or social worker and contribute to society and breathe life into, or a sense of renewal, into their cultural heritage. If the government would accomplish such an endeavor, such a system can be applied to young people in public housing projects, saving government money. If you agree with such an initiative, click share on Facebook, or retweet on twitter.